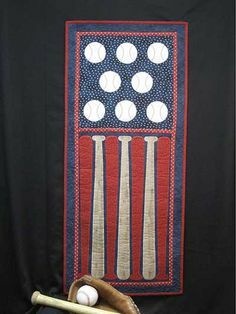 On the Design Wall this week is the baseball quilt. Below is a picture of the finished quilt. The Pattern is by Pam Bocko of Pieceful Designs. Also still in the works is Union Blues. Triangle units are complete and I am on to all the flying geese units. there are 360 of these units to make, so I will be working on this for awhile! What's on your wall this week? See more great projects at Patchwork Times.